In one of his detailled post on reloading 38 (http://www.thehighroad.org/archive/index.php/t-496743.html), Ed Harris advocates NOT resizing cases before seating, and using a Lee factory crimp die as the last step. Is that a thing, do people do this? I'm curious mostly in respect to .38, but Ed also does this for .45. Ed Harris wrote: By loading the "fat" factory Remington bullets or as-cast bullets in unsized brass, and profile taper-crimping in this manner [Lee FCD], case life is improved, bullet deformation is reduced and bullet pull is more uniform, because the brass work hardens and springs back much less when it is worked only once in profile crimping, versus when being cold worked three times in the usual method of full length resizing, expanding, seating and crimping. My .38 Special wadcutter reloads average sub 2-inch 5-shot revolver groups at 50 yards from Ransom Rest in long series of targets. I use the Ed Harris method for loading the Remington HBWC in 38 Special. Tests in a barrel tester show that the groups were much smaller at 50 yards. I can usually fire 20 rounds and end up with 18-20 X's. The barrels I used were both a 38 Special Kit and Gold Cup Mark III. 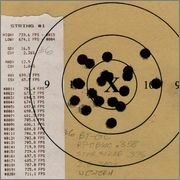 I get X-ring groups with 2.7 grains of the old Bullseye or 2.6 grains 700-X. With other HBWC bullets, I load the traditional method sizing first. I have no idea how it would improve case life. I seriously doubt that it would work in a 45. The case would still be hot and expanding as it leaves the barrel. I have over 50 re-loads on some of my brass and will keep re-loading them until they split. I have seen very few split cases from re-loading with our Bullseye reduced loads. I guess my answer would be "No". I suppose you might get a tiny increase in performance in your wheel guns but not noticeable if not using a machine rest. Plated brass totally different story on re-load life. only thing I do occasionally on my older brass is to run them all the way through a bulge buster to re-size the rim when they get beat to the point of being too large. ( won't pass through my home made Bruce Martindale ring). I found in .38 spl that some brass will not hold the bullet from seating deeper in the case on recoil. even using the Lee FCD. As I recall it was Federal brass that had the problem. Was much easier to resize then run it thru a custom machined sizing plug. It allowed the Rem 148 gr hbwc's to seat about 1/2 way in under thumb pressure. the chamfer was then taken off and crimped in the next operation. I'm not sure how this would apply to other cartridges, but I'm getting great 50 yard accuracy from my 32 wc by not resizing my slow fire ammo. Thank you everyone for the feedback. I reload with BDX bullets, and their 148 hbwc are fat like the remington, .360. So it seems it's something I could try. Jim Chapman, are you saying that that by NOT resizing, the cases were too large and wouldn't provide enough tension on the bullet? But resizing ensured you have proper tension on the bullet so it doesn't move. Without resizing, recoil would make the bullet drop inside the case? (I thought recoil would bring the bullet OUT, not in). (the other Jim), 32 wc is just a smaller 38 wc in my mind. Thank you for sharing. The crimp keeps it from coming forward. Just rattling around in the boxes caused some to go deeper. 3) A lot of flare so bullet was "in the case" and would not move while entering the seating die. 4) Use of a Redding Profile Crimp Die. I have NO IDEA what Lee FCD has a large enough carbide ring NOT to size down the Rem. bullet (maybe a .40S&W? ), but compared to all my roll crimp dies, including a Lee FCD with the ring removed, the Redding was the best, but the Lee FCD was next best. 5) Once I did those 4 things, what powder and what charge weight (as long as I got 675-775 fps) wasn't really that important any more. Presently longline testing quite a bit in prep for the season. I was fortunate to acquire a case of each.. So far, the Rem/ Peters is producing outstanding hand held groups. Not that the others are shabby, but the R&P shoots tighter..Two days of shooting, and no target under 93 with the best a 98.. I pulled bullets to measure bullet diameters and compare powders.. One thing that is very common to each, is a bullet that measures .357 or a few tenths under.. The powders are definitely not identical.. Even in the Rem. brand.. Different box, a different powder.. so, either Rem loads a different bullet in their match ammo than is sold on the bullet after market, OR, their loading process purposely swages the bullet down from 360, to .3567/.357..which would take some of the squeeze away for the tight stock 52 barrels. Even then, I believe it is too tight.. The Douglas blank in this Model 52, is .357 at 14 twist..and is shooting some great scores with this ammo..
Lee Factory Crimp Die - The carbide ring in the die, may post size the brass and bullet smaller. Lead will not spring back as much as brass. If the loaded round is sized down more than .005" , the bullet will become loose in the case. Jerry, for HBWC what dimensions do you like to size and expand to? Any preferred dies and expanders? This is copied and pasted from the OP link to the Ed Harris response. "If your target revolver or match auto pistol has tight chambers, cases expand very little so that .360 diameter bullets will hold friction tight in fired brass until the shell head on the loading machine rotates to the final station in which rounds should be full-length profiled and taper-crimped only enough to remove all mouth flare. Unless your gun has sloppy service chambers, it will be necessary to resize the brass to prevent bullets from dropping down against the powder under vibration of the loading machine, which causes DANGEROUS variations in seating depth! Ed Harris says to resize unless you have very tight chambers. My M-52 has a very generous chamber and coupled with a very tight. .3546 groove diameter has caused no end of problems in finding accurate loads. In my 38 revolvers I can get away with not resizing for about 2 loadings and then the cartridge will not fit in the chamber unless they are forced in with thumb pressure. If by chance I mix up my M-52 brass with my revolver brass and do not resize the case there is no way the cartridge will fit in my revolvers if it was fired in my M-52. For this reason and that I can see no difference in accuracy between sized and un-sized I run all 38 brass through a full length sizing die. Sa-tevp wrote: Jerry, for HBWC what dimensions do you like to size and expand to? Any preferred dies and expanders? Brass is rather elastic.. The side walls on average are .008/.009 across the big three manufacturers. I want my my bullets to remain at .3575/.358 when the enter the bore..
Mr. Ed Harris mentioned that the ammunition companies seated the bullets, after priming and charging, Then final sized them and applied the cannelure. Most all commercial ammo I have measured gauges at 0.375" outside diameter. A 0.360" bullet in a case with 0.008" wall thickness equals 0.376". Food for thought. I have never had the chance to visit an ammo factory and when you ask questions of them, they are very elusive. Mr. Harris had the pleasure of working with the NRA as a Technical Writer and got to communicate with the factories. I respect his comments. Side note. I inherited a large stash of 38 wadcutter from a shooter that fired with the All Army Team in the late 50's and early 60's. It contains TargetMaster by both Remington and Peters, some Western yellow box, and a few Federal. All of the ammo has fired X-ring groups at 50 yards in the barrel tester and several guns. Of course, back then, the Military tested the ammo prior to issuing it to the shooters and 38 WadCutter was very popular. 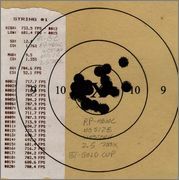 Shooting primarily ppc with the..38 the last thing you want is a tight chambering cartridge! NO alibis! Sometimes you have to give up a little something for that..
fc60 wrote: A 0.360" bullet in a case with 0.008" wall thickness equals 0.376". Food for thought. Sounds good..I don't know where this ammo originated from.. I acquired it from an estate..I was in the right place at the right time..
New Remington Wadcutter March (RTG38S3) .3765 at mouth and..375 base of bullet..fired cases on order of .381. Photos say a lot more than words. Hopefully, I have sorted out this image hosting thing. Anyway, compare the difference in the two loading techniques. The larger group is sizing the brass to 0.375" at the first station. The second, smaller, group is seating the bullet in a primed, flared, and charged case with NO SIZING. After the bullet is seated to depth, I use the Lee Carbide Factory Crimp die to close the brass case around the bullet. Final outside diameter is 0.376", if memory serves me well. Oh yes, I applied a roll crimp to ensure positive functioning. Looking at image 0002, it notes I sized the RP-HBWC down to 0.358 prior to loading . Probably due to the 0.360" bullets shearing off Lead in the sized cases. The smaller group was loaded with bullets as received in the bulk carton. Nonetheless, the loading in unsized cases has been my method since. Barrel is from my Gold Cup MKIII mounted in a barrel tester. Groups are 20 shots at 50 yards. fc60, Good pictures and great results. But. It makes me wonder if the smaller group is because of not re-sizing or is it because you re-sized the bullets down to .358 in the resized cases? One of the things that makes Rem bullets shoot so well is they are soft and large. Just curious. As stated, you changed multiple variables on the 2nd target. Which tells me, if, the Rem HBWCs the factory uses is the same .360 diameter we get after market, the factory is also squeezing it down similar to the Lee die..I can see the logic behind it. Very secure, with the C-groove..Never a chance of set back, and the bullet is down in diameter where it should be. After all this time, and after seeing this method referenced a number of times recently on this forum, I decided to finally give it a try. Here’s my experience, with my gun (S&W Model 14), my dies (Lee) and my brass (I used Geco for this test). Td;dr: makes sense, only if you have very fat bullet like the .360 remington. Forget it with .357 hard cast DEWC, it’s dangerous. First, a few measurements of the diameter of the cases. After firing: 0.379-0.380. After Lee Factory Crimp Die (FCD): 0.378. And after Resizing die: 0.373. On to my experiment. I tried two methods: 1) not resizing at all, and 2) using the FCD with the crimp backed-out to resize. I used two different bullets. The first is a fat 0.360 BDX 148gr HBWC, that used to be sold by Montana Gold. It’s the most accurate bullet I have. The second is a hard cast 148gr DEWC sized at 0.357. With the BDX bullet, not resizing or using the FCD to resize seemed like an improvement over using the resizing die. Seating required less pressure which gives the reassuring feeling that I’m not swaging the bullet at this stage. And even without resizing, the case provided sufficient friction. I can push and pull the bullet with my fingers, but it provides resistance and I’m not worried that the vibration of the press will affect seating depth. However, with the .357 bullet, either method left the case large enough for the bullet to fall inside. Luckily, a gentle shaking of the cartridge upside down was all that was required to get the bullet to fall free from the case! Ed was right, in some cases "it will be necessary to resize the brass to prevent bullets from dropping down against the powder under vibration of the loading machine". I would never load these small bullets without resizing. A note about crimping. After the BDX bullet is seated, I ran it through the FCD with the crimping backed-out, to remove the flare. That alone was not sufficient. It was still possible to push the bullet within the case with medium finger pressure. I adjusted the FCD to crimp the top of the brass into the bullet at 0.375, a mild crimp of 0.003. That seemed sufficient to secure the bullet within the case (no magnum loads here). In conclusions… Not resizing seems like a good way to avoid compressing the skirt of large hbwc bullets. Others have ransom tested it and it has shown to provide an improvement over resized cases. Crimping is important. Not resizing is dangerous with smaller hard-cast bullets, as it allows them to drop within the case. Again, these are my results with my gun, my dies and my brass. YMMV. Not resizing will work IF your chambers are are not too big or too small, and IF you are using the large size (.360") Remington HBWC's. However, a way around all this for those who don't have the above ideal conditions is to have a custom expander plug made as Jim mentioned and to be sure to use wadcutter brass. I had a custom expander plug made for my RCBS expander die that measures .3575" and goes all the way down to the part of the brass where the hollowbase resides. Works really well with the .359" HBWC's I am using.